Most home sellers -- about 4 in 5 -- use real estate agents to list and sell their homes. Of the other 20 percent, some sell FSBO, also known as For Sale By Owner. Other owners, however, sell without marketing their homes. 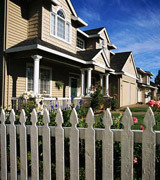 Property transfers between family members account for some of the direct home sales. Also, tenants are often offered the opportunity to buy the property they are renting before the landlord lists it for sale.